The British army made a bloody mess of it in 1972 and now at least one may pay the price if convicted. There may be good sense in going after one soldier with viable evidence, rather than going after many who could obfuscate proceedings and create a far greater strain on the prosecution, leading to an acquittal or a total collapse. The decision to prosecute one soldier is a milestone and a real indication that justice must be seen to be done – albeit in a limited way for now. The prosecution of solider ‘F’ should be seen as test case and more may follow depending on how successful the case is. Perhaps the relatives of the victims of Bloody Sunday should not give up hope on more being prosecuted in time. Technology and forensics are getting more advanced all the time. Death does demand responsibility and those responsible for keeping law and order must answer. Soldiers it seems can now be prosecuted if the evidence is viable enough and this is a major turning point in Northern Ireland’s history. It is impossible not to think that one conviction will have an overall affect on the Bloody Sunday families who have fought so hard to get this far. Their spirits maybe weak and hearts broken, but they shine in the eyes of justice and keep their loved ones from being forgotten. How very commendable their quest for justice is in a place where justice has been politicised for so long. The victims group of the Bloody Sunday killings were disappointed, but one conviction, if successful, will amend some of the past to some degree and will set a precedent for the future in throwing away the shield which has protected the uniformed for too long. Demilitarisation was perhaps the only enduring thing which came out of the peace process and the realisation that civil policing was the answer. But the lessons have been learnt slowly and at a great cost. Politics and justice are crude tools which require great effort to squeeze something good out of them. Most of the time the two instruments generate nothing but bureaucracy and it takes a lot of pushing and shoving to get the two dinosaurs to move. But the organs of state cannot and should not ever ignore the call to put things right otherwise they are a redundancy and serve no constructive purpose. The unfortunate irony of Bloody Sunday and many other horrible blood baths is that Northern Ireland runs the real danger of slipping back into the past with the crippling and destabilising effects of Brexit. 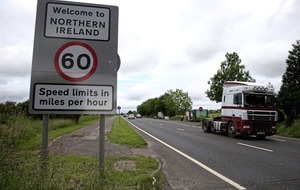 Is Brexit going to bring Northern Ireland back to the bloody past or will it rise above it? Therefore by this admission were the military and police operating under a shoot-to-kill policy? In 1984 an inquiry under Deputy Chief Constable John Stalker of the Greater Manchester Police was set up to investigate into three specific cases of a shoot-to-kill policy. He came to some very startling conclusions and was removed from the inquiry shortly before it was due to report in 1986. The British government had always denied any shoot-to-kill policy. In fact Margaret Thatcher cited the need to protect ‘her boys’ in rejecting the shoot-to-kill inquiry. There’s an inheritance of colonial violence. David Cameron in the past had suggested that Britain and the legacy of its empire were responsible for many of the world’s historic problems. The north of Ireland is a case in point – detention without trial, beatings, torture and killings punctuated by the Troubles. In his book State Violence Raymond Murray posed the questions, why can agents of the British government kill people manifestly innocent in very suspicious circumstances and never pay any penalty? Are they really operating under the law if they are never effectively made amenable to law? Are they above the law? Is there a conspiracy to make them immune from effective prosecution? Since the signing of the GFA, the office of which Bradley holds has been a dumping ground for a political nonentity. They have revealed a disappointing lack of historical judgment and have failed miserably. They have come unprepared or advised of the well-documented politics of the north of Ireland and in the case of Karen Bradley, she has been the worst of the lot. It is beyond acceptable for her to remain in her position and she should resign. 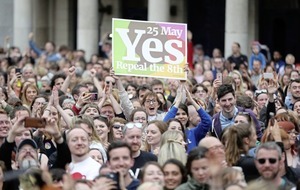 Ending England’s rule in Ireland (often shortened to ‘England Get Out of Ireland’) is a perfectly legitimate expression of historic Irish-American wishes for Ireland. Not only that, but using ‘England’ as distinct from Britain makes the point that Wales and Scotland can hardly be blamed for the mistreatment and later in 1920 for the partition of Ireland. Furthermore, there is no way the unionists/Protestants can claim that such a formulation implies they should get out of Ireland – no more than pro-UK union people would have to leave Scotland when Scotland opts for independence. 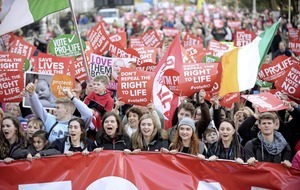 would be if Mary Lou had refused to march with that banner. After all, Jimmy Carter in 1976 – seven months before he was elected president – famously marched in the New York St Patrick’s Day Parade wearing the button ‘England Get Out of Ireland’. And Mary Lou, the president of Sinn Féin, is not supposed to show such sensibility and solidarity. Are you kidding me. Could anything be more ahistorical… And we are told it’s Irish-Americans who are ahistorical regarding Ireland. The folly of Sinn Féin’s abstention from Westminster was once again brought into sharp focus when, within the last week, a number of key votes were lost by narrow margins particularly the amendment tabled by respected Labour MP Hilary Benn. His amendment was defeated by two votes. Had it been passed, it would have enabled the parliament rather than the government to take control of parliamentary business and the Brexit process. Such a step would have been better in protecting the interest of both parts of Ireland as we reach the end game of this process. It is likely that will be a series of further key votes. If Sinn Féin continues with its abstentionist policy and key decisions which would have been beneficial to Irish interests are defeated by less than seven votes then history can only conclude that along with the DUP they have both betrayed the long-term interests of this island. The Irish Freethinkers and Humanists offers its condolences to the people and government of New Zealand over the mass murder of 50 Muslims in their place of worship. This is not only an attack on a religious group but also an assault on humanity. We stand firm with all who wish freely to express their religious faith as well as those of us who have none.